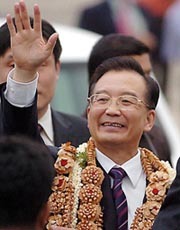 Chinese Premier Wen Jiabao arrived in Bangalore this evening on his four-day official visit to India while top officials of the two countries here finalised a Protocol on Confidence Building Measures. Is an export target of $ 92 billion in the current fiscal feasible? 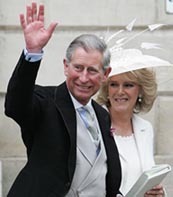 Britain’s Prince Charles today married his long-time sweetheart Camilla Parker Bowles, making official a relationship that endured off-and-on for more than 30 years. There is more to watching cricket than what is said to be on the cards during Pakistan President Pervez Musharraf’s three-day visit to New Delhi from April 16. Elections to Gram Panchayats, Block Samitis and Zila Parishads in the district were today marred by violence at many places, resulting in two deaths and injuries to more than 50 persons. We were missing the collective effort in the last two games, but this time it was a good team effort. A Pakistani businessman has been charged by American prosecutors with illegally exporting devices from the country that could be used to develop nuclear weapons while his alleged South African partner has pleaded guilty to arranging illegal export of US-made equipment to Pakistan and India. A factory or farm worker, a daily wager or a rickshaw-puller in Punjab will pay Value Added Tax on most all items he buys. Living in either a rented room or his own “kucha house”, he will now be required to pay 4 per cent VAT for ash bricks or refractory bricks or earthen tiles and on lime and lime stone for white washing a new structure. A two-day National Executive meeting of the JD (U) starting here tomorrow is likely to debate the party’s future course of action in Bihar even as its senior leader Nitish Kumar said he was abandoning efforts to form government. 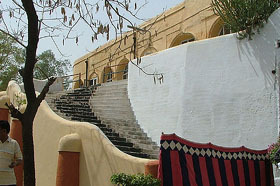 The military history of the legendary Mahraja Ranjit Singh and the British that remained behind the iron curtain for more than one and a half century, will now be thrown open to the public following the formal handing over ceremony of the 250-year-old historic Gobindgarh Fort, to the state government by the Prime Minister, Dr Manmohan Singh, to mark Baisakhi here.